Publication d’un ouvrage par le groupe de recherche de Francfort. Time and again public attention in Germany focuses on regulations which claim a divine origin or other religious justifications – especially when religious law is in conflict with other bodies of law. Notwithstanding some specific differences in legal content, there is also common ground between Christian and Muslim approaches to and reflections on divine law. 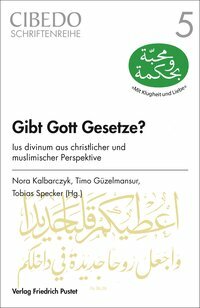 The fifth volume of the CIBEDO-Schriftenreihe aims at tracing some of the questions which Christian and Muslim theologians have been and are working on in the context of divine law, for example the question of how divine law relates to revelation or whether it is dependent on the historical context. The volume is divided into three parts: In the first part Helmut Pree and Rana Alsoufi inquire into the relation between divine law and theology from a Christian and a Muslim point of view respectively: In which way is religious law theologically grounded and how is the interplay between religious legal theory and theology? Subsequently, Serdar Kurnaz and Thomas Meckel asses in the second part of the book how in each of the two traditions revelation and religious law relate to each other; in doing so they also investigate the relation between history and religious law. In the third part Matthias Pulte and Hakki Arslan focus on natural law approaches in Christian and in Muslim legal theory.